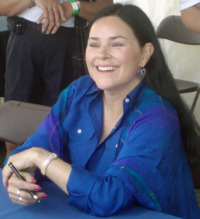 Diana Gabaldon holds multiple degrees in science: Zoology, Marine Biology and Quantitative Behavioral Ecology. She taught at the university level for years before she began writing fiction. Gabaldon has had many scientific articles published as well as textbooks. She worked as a contributing editor on the Encyclopedia of Computers and founded Science Software Quarterly. Outlander, the first in Gabaldon’s series, was released to critical acclaim in 1991. She has since written six more novels in the series, all of which are New York Times Bestsellers. The series is published in over 26 countries, in 23 languages and has 19 million copies in print. Her series even includes The Outlandish Companion, which gives background on the series. Gabaldon has also written a spin-off series of Outlander and a graphic novel which is set in the Outlander universe. She is currently working on another Outlander novel and a mystery series. She lives in Arizona with her husband.